There is no spiritual predecessor mumbo jumbo going to be discussed in this review. No, “this car reminds us of that ” or anything of the sort. The M135i is the first incarnation of a gasoline fueled BMW M Performance Automobile and it deserves its own time to shine. How it behaves is less about racing and track days than it is about having a street car that is sporty and a blast to drive. But what ‘s the point of driving a model the US will never see? Read on and you ‘ll understand why this model isn ‘t just interesting for BMW enthusiasts but quite significant..
BMW recently revealed the new, F21 3 door hatch in Europe- they call it a three door for some reason although it really only has two doors and the rear hatch; puzzling. Simultaneously, the M135i was dropped as if from heaven into a market place which was screaming for a performance minded rear wheel drive hatch that is a complete riot to drive. The M135i is the answer to the pleas many enthusiasts have made in emails and on the internet for a vehicle that would fill their needs for practicality and perversion, thankfully BMW M was listening. 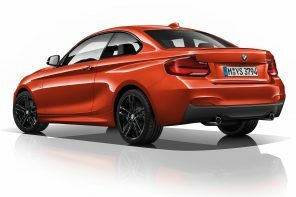 The M135i will be offered in either 3 door or 5 door for markets outside North America. While not a full on M product like the M3, M5 or M6, the M135i has had about 30% of it sorted out by the engineers in Garching. What ‘s 30% in the grand scheme you balk? For starters they replaced the crank with a forged unit to withstand the abuse of dialing up the boost. Yes a forged crank, they built this dual scrolled turbo inline six N55 engine up proper. The engineers added in extra cooling to keep the engine from cooking itself and built an exhaust that drops the center silencer to add pops and growls like a caged bear being fed a T-Bone steak- raw. Redline creeps in at 7000 RPM, with horsepower peaking at 320 and torque at 330 lb-ft. What is eye opening is that the power to weight ratio is the same as the famed 1M coupe. Practicality and sporty can ‘t be said of a car that has a suspension that is bone jarring and uncomfortable, thankfully the M135i uses fully adjustable dampers and custom bushings combined with a 10mm drop to provide sporty handling or a nice ride, whatever the driver wants. Same goes for that aggressive exhaust, it is valved based on the position of the Driving Experience Control rocker switch. Comfort and Performance can go hand in hand and was the basis of the M135i. Available with the sensational ZF 8 Speed that can ‘t receive any more praise without developing a superiority complex and a six speed dry sump with that US craved third pedal. The eight speed is quicker, more efficient and with the steering wheel mounted pull-pull paddles is a hoot to snap passengers ‘ necks back. Braking is improved thanks to four piston fixed calipers up front and half that number providing the rear bite. Balance is great and the car induces smiles as easily as the rear end can be swung out. It never says “uncle ” it just likes to be a hooligan. Steering is a custom M tuned EPS unit with servotronic. It ‘s well weighted and actually had some nice feel compared to the run of the mill system in say, the F10 5 Series. Is it as good as the hydraulic racks in the current M3 and 1M? Not exactly, but this is by far the best EPS to come out of BMW since the switch over started a few years ago. The M135i ‘s steering shows that M has a grasp on what they need to do to make the system feel the road, something that is good news for the future M3 and one that should help us traditionalists relax a bit. Summed up, M135i is the best happy medium yet from BMW. It is sporty and drivable day to day while never being a compromise during a commute. It will even be offered with xDrive this fall for those that want it, not a bad call if living near the slopes. It may not be as fast on a track or even have a limited slip rear differential like a full on M but it is more fun to drive than most cars out there and it ‘s a hatch! Another huge plus is it ‘s the only one in class that is not front wheel drive based. Pricing will be significantly cheaper than a full on M product while still offering exclusive styling and trim, which will appeal to a large group of buyers. In our eyes the M135i is a success no matter how you slice it. This is especially true when you consider that this car will be coming to the US in the form of a 2 series coupe. We ‘d take ours in the five door variety but those wishes seem to be not loud enough or maybe we are the only voice in the crowd. Either way, the US will see a M235i in only the next generation coupe as the door has been slammed shut for the US to see any hatches this go around. But with the 1M out of production and almost impossible find on the used market, the wait will be worth it. The M235i sounds like it would make a nice convertible for me here is sunny Miami. Top down with a sporty exhaust is just what I need. Is that a special interior. What I don’t like are those lights those have to go. The interior is pretty much what the rest of the world gets as “MSport” cloth/Alcantara seats that are amazing and door inserts- US gets everything else if I recall. IT baffles me why the US will get a 1x, 3x, 5x, 5, 6 GT, 6, 7, 1, 3 etc. etc. but for some reason they won’t ship a hatch! If you’re gonna microfragment the market, go all the way! Seems that a perfect car to get sold here because of the success of the 1M won’t get a chance… And your voice isn’t the only one that wants a 1 series 5 door… Oh well…. Glad to know we are not the only ones! I guess that the US was considering the hatch but opted out because the price point would be high compared to the competition- but really there is no competition bc last time I checked there were no rwd hatches in the US. Or did I miss something? I spent close to $40K on a Mini. I’d so rather spend a tad more for this! I imagine this has been discussed at length – and please direct me to those posts – but isn’t the elephant in the room the fact that BMW doesn’t race with any of their turbocharged engines? With all these new M (and “M performance”) cars, and the whole U.S. line up in general, going forced induction, what engines are going to replace the 320i, 328i, Z4, and M3 race cars? Will this not become an issue in the U.S. enthusiast market at some point? Will there be no direct connection in the engine bay among the race cars and the models regular people buy? What will serve as our club race cars over the next 10-20 years? Note: I’m excepting the WRC Countryman. I believe the discussion is still worth having. The 1.6L turbo in the Countryman WRC also powered the BMW 3 Series in the WTCC. Otherwise we’ll be seeing more turbos as the M3 changes over. @disqus_q596BuEuqn:disqus The big issue is not that BMW doesn’t race turbos outside the S2000 FIA regulations because nothing else currently allows turbos for homologation purposes. the ALMS GT class for example requires NA engines, the DTM is a purpose built engine that is NA and Daytona Prototypes are STILL using the old E39 M5 V8 (S62). There is a large lobby ongoing to allow turbos in more series… certainly something has to give. Great info, from both Gabe and Michael. Thank you.